I’m sure by now; anyone with a Pinterest account has seen this pin. 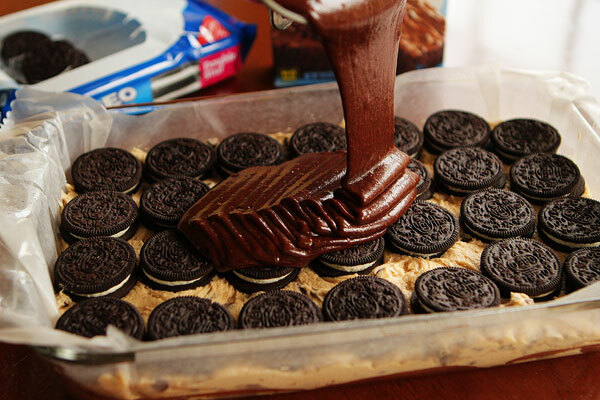 It’s a layer of chocolate chip cookie, topped by a layer of Oreos, topped by a layer of brownie. Sounds like Heaven to me! So I decided to give it a whirl. The pin originally comes from Kevin & Amanda. Start by making your chocolate chip cookie dough and spreading it out in a wax lined and greased 9x 13 pan. Next add your layer of Oreos. I, of course, used Double Stuffed. Next up is the brownie batter layer. I ran into a small issue with this layer. I didn’t use my usual favorite brownie mix. I bought the super extra fudgy kind. Silly me assumed that all boxed brownie mix made enough batter to fill a 9x13 pan. But I quickly found out that’s not the case. So I had to work a little magic to get the batter to spread over the whole Oreo layer. Bake for 45-50 minutes. Then enjoy! The Verdict: While my version did not look as appealing as the original, it still tasted delicious. Kevin and Amanda suggest serving with ice cream. I’m sure that would amazing but it tasted fine on its own. I actually even liked it better the following day. I will say it is very heavy so there’s no risk of eating the whole pan on your own. Things to Note/Consider: Definitely make sure that you have the right brownie mix. I think it would have looked better if I had more of it. Also, the original site said to bake for 40-45 minutes at 350 but mine definitely had to bake longer.